tubing wall to create a seal. 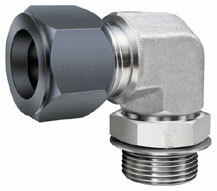 The resulting spring-action joint offers a leak proof seal and resistance to vibration. The SAE flareless tube fitting is an excellent fitting system for higher vibration hydraulic systems where a user does not wish to flare tubing. On dynamic hydraulic systems, the SAE flareless tube fitting is recommended over other flareless tube fitting systems, specifically compression, or “instrumentation.” The design of the SAE flareless single biting ferrule holds the key to this superiority. use of gap gauges or by counting the number of hex flats torqued from a finger-tight position. tubing can withstand as the ferrule bites deeper and deeper into the tubing wall with each reassembly. strongly discourages the intermixing of components from different manufacturers.